The Tucson Mountains are due west of Tucson, Arizona. The Tucson Mountains are a range small in scale and short in stature. But they are big in beauty and bold in ruggedness. They are the lowest of the four mountain ranges surrounding the City of Tucson. The others are the Santa Catalina Mountains, Rincon Mountains, Santa Rita Mountains and the Tortolitas. Rocky and scrappy desert peaks that represent the character of the area. Do people climb these majestic slopes. Well, yes! But it is not an easy climb. Hikers must brave desert bushwhacks and rock scrambles to reach the summit. If you make it, the views are spectacular. Combining interesting urban Tucson and the wild desert mountain landscape. What makes a trip to the Tucson Mountains a special treat is the Sonoran Desert landscape. The diversity in plant life and desert understated gem of the Arizona landscape. Together, these 5 ranges create a beautiful setting from almost any location in the greater Tucson area. And they protect Tucson from the Haboobs experienced in Phoenix. The Tucson Mountains are not high compared to the Santa Catalina Mountains. They rise to only 4,687 feet. This mountains range is the remains of a more than 15-mile-long collapsed volcano. For the Geologists, that is a volcanic caldera. The eruption occurred some 70 million years ago. And the force was greater then the Mount St. Helens eruption in 1980. The rock layers in the mountains reveal a pre-historic landscape. It included a large oyster-rich freshwater lake near what today is Wasson Peak. Dinosaurs roamed around the lake. And camels trod the mudflats. While mastodons fed on the grass around the lake. The volcanic cycle that created the Tucson Mountains created other mountain ranges in southern Arizona. In Tucson, the Silver Bell Mountains, Sierrita Mountains and Santa Rita Mountains. The Chiricahua Mountains in southeast Arizona to shape. 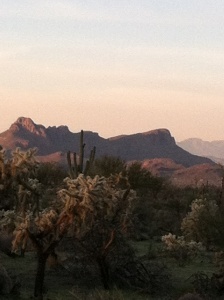 And the Superstition Mountains near Apache Junction, AZ. Along with other notable Arizona ranges. A notable spot in the area is the Arizona-Sonora Desert Museum. This world renown museum is on the west side of the Tucson Mountains. Two other parks in the Tucson Mountains are the Saguaro National and Tucson Mountain County Parks. Stay up to date on what’s happening in Tucson, AZ. Sign up for our Monthly NEWSLETTER – OR – Request Tucson Real Estate INFORMATION. They are FREE! A great place to visit is Old Tucson Studios. Once an important location for western movies. John Wayne is among the many stars to have made movies there. Old Tucson Studios are open the year around. This “step back” in time also provides visitors many one time experiences. Stunt shows, gunfights, and musical reviews. Movies are still filmed there. The Tucson Mountain Park, established in 1929, is over 20,000 acres. It is one of the largest natural areas owned and managed by a local government. The park has about 62 miles of shared-use trails. The area is popular with hikers, mountain bikers, and equestrians. But motorized vehicles are NOT permitted. The Tucson Mountains offer a range of Tucson hiking trails from flat and easy to very rugged. Saguaro National Park, founded in 1933, was later designated a national park in 1994. The Tucson Mountain District of Saguaro National Park rises from 2,180 ft to 4,687 ft. It contains 2 biotic communities. One desert scrub and the other desert grassland. The average rainfall is just over 10 in per year. Common wildlife includes quail, coyote and desert tortoise. The Tucson Mountains are a majestic backdrop on the west side of Tucson, AZ. Homeowners living in the foothills of the Tucson Mountains have stunning views of the City and eastern ranges. Tucson is a wonderful place to visit and a great place to live. Looking for a place to retire or a winter get away we can help you find your perfect Tucson home.